Recent studies suggest that closely related species can develop significant genetic and phenotypic differences throughout their evolution despite ongoing gene flow. The findings challenge the traditional views regarding the genetics of speciation. A new study conducted by Vetmeduni Vienna, funded by the Vienna Science and Technology Fund (WWTF) and published recently in Science Advances, analysed the genomic differentiation among six baboon species. The international research team found evidence for hybridization of ancient and recent generations among divergent species. These results help inform the understanding of similar cases, including the complex diversification and genetic admixture among modern humans and our extinct relatives like Neanderthals, Denisovans and other hominins. Like our own genus Homo, the ancestral stock of Papio baboons began diverging into multiple lineages (phylogenetic species) within sub-Saharan Africa about 1.5 million years ago. Today’s baboons (genus Papio) are large, geographically widespread Old World monkeys which – unlike Homo – consist of six readily distinguishable species that hybridize in the wild. Like early Homo, baboon species differ in body size, morphology and behaviour. In their study, the researchers were able to document multiple admixture events for several baboon lineages, with some episodes involving genetic exchange among lineages that persist to this day while other episodes involved extinct lineages. The diversity of baboons provides an opportunity to investigate the genomic, morphological and behavioural aspects of evolutionary radiation in a broadly successful and adaptable primate. Carolin Kosiol from the Institute of Population Genetics at Vetmeduni Vienna and the Centre of Biological Diversity at the University of St Andrews, explains the method employed by the international research team: “We produced a reference genome assembly for the species Papio anubis and sequence data for the whole genome for all six extant species. In a further step, we documented multiple episodes of admixture and introgression during the radiation of Papio baboons, thus demonstrating their value as a model of complex evolutionary divergence and hybridization. This provides new insights into cladogenesis in general and the nature, rate and consequences of genomic evolution in particular. Especially helpful were new genome-wide computer programs developed by my former doctoral student Dominik Schrempf.” DNA samples were obtained from both wild animals as well as captive baboons. Studies of the hybridization revealed no significant barriers to reproduction. Even dramatic differences in the social systems do not prevent different species from hybridizing in the wild. This evidence was documented for the two species Papio anubis and Papio hamadryas, which differ significantly in their social organisation and social structure. 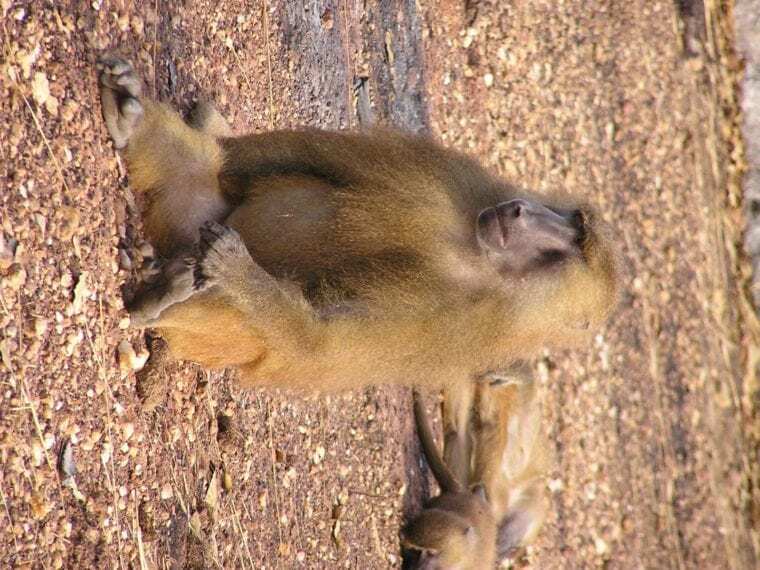 Among Anubis baboons, both males and females are polygamous. Hamadryas societies, on the other hand, are multi-level, with “harem”-like one-male breeding units (OMUs) as basal social entities. However, there is evidence for differences in the success of mating types and a certain degree of genetic incompatibility among different baboon species. Baboons, in contrast to humans, can still be studied in hybrid zones today. As such, they constitute an important context for future research. Potential areas of study include the effects of genetic variation on neurotransmitter function and its impact on species-level differences in social relationships and social behaviour or the investigation of the effects of increasing genetic differentiation. The article “The comparative genomics and complex population history of Papio baboons” by Jeffrey Rogers, Muthuswamy Raveendran, R. Alan Harris, Thomas Mailund, Kalle Leppälä, George Athanasiadis, Mikkel Heide Schierup, Jade Cheng, Kasper Munch, Jerilyn A. Walker, Miriam K. Konkel, Vallmer Jordan, Cody J. Steely, Thomas O. Beckstrom, Christina Bergey, Andrew Burrell, Dominik Schrempf, Angela Noll, Maximillian Kothe, Gisela H. Kopp, Yue Liu, Shwetha Murali, Konstantinos Billis, Fergal J. Martin, Matthieu Muffato, Laura Cox, James Else, Todd Disotell, Donna M. Muzny, Jane Phillips-Conroy, Bronwen Aken, Evan E. Eichler, Tomas Marques-Bonet, Carolin Kosiol, Mark A. Batzer, Matthew W. Hahn, Jenny Tung, Dietmar Zinner, Christian Roos, Clifford J. Jolly, Richard A. Gibbs, Kim C. Worley and the Baboon Genome Analysis Consortium was published in Science Advances.